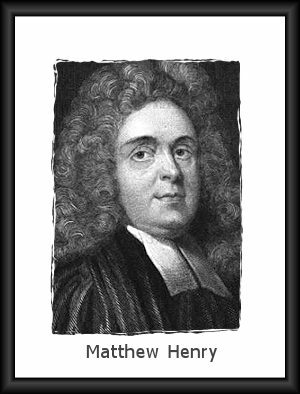 Matthew Henry (1662-1714) was a Welsh-born, English nonconformist minister and Bible commentator. He is remembered for his practical and devotional multi-volume Exposition of the Old and New Testaments which is still published. Matthew Henry: Noncomformist Minister and Commentator. Matthew Henry: Minister and Bible Commentator. Matthew Henry, the Great Commentator. Biographical Sketch of the Rev. Matthew Henry. Rev. Matthew Henry: Last Days and Funeral. Matthew Henry: Preacher and Scholar. eBook about Matthew Henry and his writings. Matthew Henry married Katherine Hardware in 1687. She died in childbirth, Feb. 14, 1689, at age 25. Their daughter, Katherine, was named after her mother. On July 8, 1690, Henry married Mary Warburton, who survived him. They had one son, Philip, and eight daughters: Elizabeth (died in infancy), Mary (died in infancy), Esther, Ann (died in infancy), Elizabeth, Sarah, Theodisa and Mary.